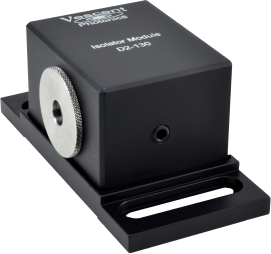 Vescent optical and electro-optical modules are designed to provide rugged, vibration immune operation in a small foot print. Innovative uses of liquid crystal and waveguide technologies provides functionality that was previously only realised mechanically. 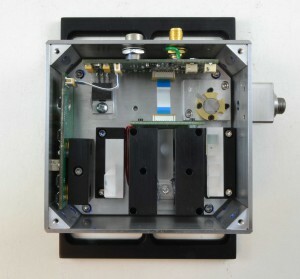 Vescent modules are designed to be mutually compatible, allowing the user to take advantage of Vescent’s non-mechanical approach to design sophisticated AMO experiments in a uniquely small optics-table footprint. The D2-210 second-generation Spectroscopy Module makes locking to atomic transitions easier and more powerful than ever before. 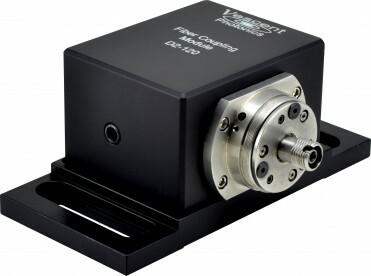 Completely redesigned to maximise performance in a number of laser-locking environments, the D2-210 makes atomic absorption-referenced frequency locks simple. Designed to work as a general-purpose frequency discriminator, it is compatible with the D2-125 Reconfigurable Servo as well as other feedback loop filters. The D2-210 can be charged with either Potassium, Rubidium, or Caesium. It is magnetically shielded to reduce perturbations due to magnetic fields and accommodates free-space or, optionally, fibre-coupled input. The D2-210 allows flexible operation, accepting laser powers from microwatts to over a hundred milliwatts, and it also offers improved, easier-to-align optomechanics and a beam path that effectively eliminates back reflections to the laser. 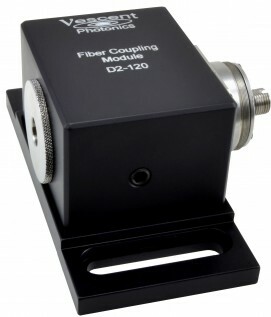 The D2-210 provides a signal to lock to either the side of an absorption or the peak and can optionally support Doppler-broadened background subtraction as well as Dichroic Atomic Vapour Locks (DAVL) and Zeeman locks. The D2-160 high-speed detector has a full 9 GHz bandwidth for capturing beat notes between lasers of different frequencies. It can also capture fast rising edges of laser pulses for timing, triggering, and pulse synchronisation. The D2-160 is compatible with both the Vescent D2-150 Heterodyne Module and the D2-135 Offset Phase Lock Servo. In combination, a true phase lock between a pair of lasers with a user-defined frequency offset can be established. The new D2-250 heterodyne module is designed to deliver an optical beat note to the D2-135-FC Offset Phase Lock Servo (OPLS). The OPLS compares the divided-down beat note with either an internal or user-supplied reference signal and locks the Slave Laser tightly to maintain the desired offset. The new kinematic adjustment feature of the D2-250 makes co-aligning master and slave lasers faster and easier than before, while the use of rotatable waveplates at the inputs and polarising beam splitters allows adjustment of pick off percentage for accepting a large range of powers. The unit itself only requires a tiny fraction of the total laser power from the two lasers. The isolator module contains a 35 dB isolator and ½-waveplate in a rugged and compact package. The beam height matches other D2-series modules. The D2-130 can be used whenever extra isolation is desired, such as before the PICOS module or as added isolation prior to fibre coupling. The D2-120 is designed to facilitate coupling of a laser beam into either single or multimode optical fibre. The module incorporates a 35 dB optical isolator prior to the fibre facet to reduce optical feedback. An FC fibre receptacle with alignment adjustments is provided. The incoming beam height matches other D2 series lasers and optical modules.